"HCJ" is a professional exhibitions focusing on the Hotel & Lodging Industry, the Restaurant Industry such as restaurants, bars and cafes, the Catering Industry such as hospitals, welfare facilities and schools. In the HCJ 2014, there were some lectures of Japan Tourism Facilities Association for their 60 years anniversary. 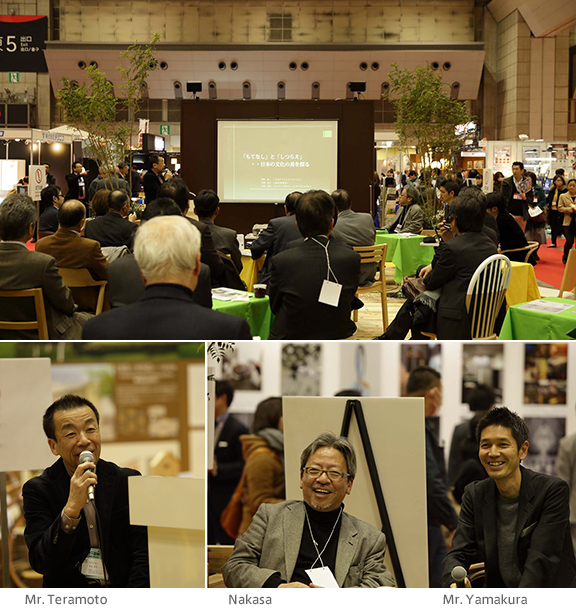 Takeshi Nakasa joined one of the lecture as a panelist with Mr. Masashi Teramoto / MEC Design International, and Mr. Reiji Yamakura / Shotenkenchiku Magazine. They talked about the Japanese traditional culture of beautiful furnished and hospitality in the lecture. Based on the slide show with Nakasa's photograph of hotels and residences and Mr. Yamakura's selected projects of some Japanese restaurants, they enjoyed talking with their thoughts and various episodes.